Hydra+ Foundations are specifically formulated to moisturise and provide light, even coverage, complementing the skin’s natural colour. The liquid formula has a rich and creamy texture allowing the product to glide onto the face, leaving the complexion flawlessly smooth and even looking. Available in four colours to match skin colour perfectly. Contains Ginko Biloba Leaf Extract, an antioxidant with moisturising and soothing properties. Contains Panax Ginseng Root Extract for a skin brightening effect. Contains Sodium Hyaluronate to promote hydration. Contains Tocopheryl Acetate, a form of vitamin E, an effective antioxidant with moisturising properties. Assists in shielding the skin from the sun and environmental stresses. 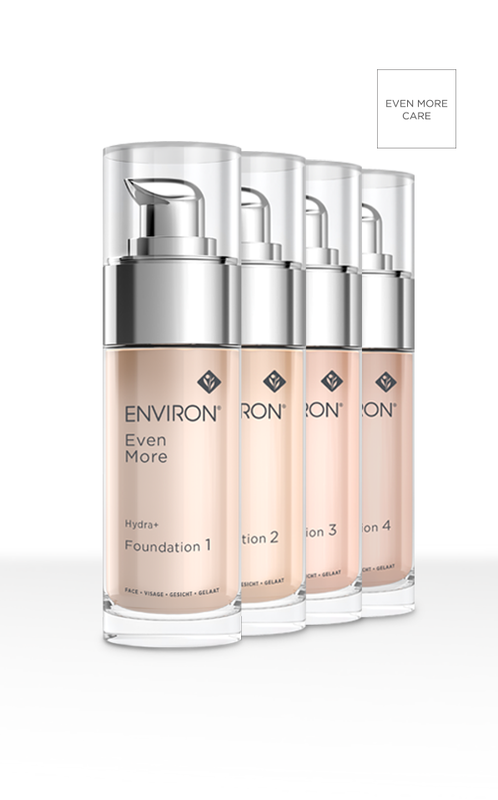 Cleanse, tone and moisturise with your preferred Environ Skin Care products. Apply Hydra+ Foundation to cheeks, forehead and chin with fingertips or make-up sponge. Blend the product in light smoothing movements until coverage appears even, and then blend upwards toward the hairline and neck. Light, even coverage with an instantaneous lifting effect that helps to reduce the visible appearance of blemishes, shadows, under-eye puffiness and circles.